Tying up to a mooring ball shouldn’t be too complicated – pull­ up to the ball, pick up a rope, and tie it on your boat. Simple, right? Well, maybe on a small power or sailboat, but it all changes on a large charter yacht. Below are the basic steps to successfully securing a cruising catamaran to a mooring ball using the engine. This sequence is generally the same for monohulls, power, or sail. Know and discuss these steps with your crew before you head into the mooring area. When approaching mooring field, start engines, then drop sails. Bring boathook to bow. Drive through mooring field once slowly to identify your potential mooring ball, as well as wind and current effect. 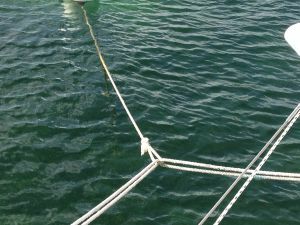 Boat mooring lines should already be rigged and secured to cleats, with one line leading from each hull’s forward-most cleat. Make sure lines are not lead inside any stanchions, etc. Station one person forward with the boathook. Station another crew amidships to give steering hand signals to helm person. Helm person typically cannot see mooring ball once boat is close. Steer boat slowly toward ball from down wind or down current, whichever has more impact on boat control. Helm person should center the ball between the hulls. As mooring ball pennant loop (has small buoy on it) comes into boathook reach, stop the boat. Use boathook to pick up pennant loop. Do not pick up mooring ball anchor rode that runs underneath ball. As soon as pennant is retrieved, run one boat mooring line through pennant loop, then back to boat cleat, and secure to original cleat. Once one side is secure, run second mooring line through same pennant loop and return to its original cleat. When boat and crew are settled, pay out line evenly between both mooring lines until pennant loop touches water or boat rides comfortably. Double check cleat hitches for correct “locking loop.” Hitch should look like a “figure 8,” with one line running perpendicular over the other two. The key to a safe and easy mooring is to establish with your crew how the boat will approach the mooring ball before you get there. Confirm what hand signals to use for “turn left,” “turn right,” “stop,” “slow down,” and “reverse.” Have this discussion after you drop/furl the sails. Don’t wait until you are on “final approach” to the selected mooring ball. For early arrivers at the mooring field, watching boaters attempt to tie up to a mooring ball has provided many afternoons of entertainment. If you understand and follow these basic steps, you won’t be the entertainment.